Sadara Chemical Company, a ‘game changer’ in the chemical industry, has safely and successfully completed the Creditors Reliability Test, or CRT, a monitored exercise to show the company’s financial backers that it is capable of running all its market facing plants in excess of 90 per cent of design rates for a period of at least 60 days. Sadara CEO Dr Faisal Al-Faqeer rates the CRT as Sadara’s top achievement of 2018 when it was completed on December 17. “Successful completion of this test means that Sadara has entered a “business as usual” mode, demonstrating to its lenders that our Jubail chemical complex can operate and produce products as promised. “We are very proud of the performance of our workforce in this regard. It is extremely rare for a company to pass this kind of test on the first official run, as Sadara did,” Dr Al-Faqeer told Gulf Industry in an exclusive interview. On the challenges Sadara faced, he says one important challenge was making sure the complex was brought on-stream as safely as possible, and Sadara achieved this goal with a world-class safety record. 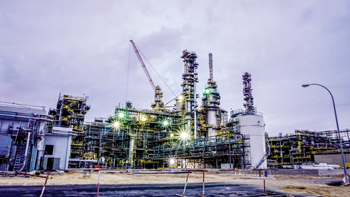 A joint venture of Saudi Aramco and The Dow Chemical Company, Sadara Chemical Company has created the world’s largest chemical complex ever built in a single phase. How does Sadara catalyse the growth of Saudi Arabia’s downstream manufacturing industry? Sadara produces high-performance plastics and speciality chemicals that meet the needs of the growing middle class in Saudi Arabia (not to mention other growth regions). Many of these products have never been produced in-kingdom before, and they provide a stimulus for the growth of new industries in Saudi Arabia. Coupled with this is Sadara’s collaboration with the Royal Commission for Jubail and Yanbu in the development of the PlasChem Park, an industrial zone next-door to Sadara’s chemical complex that offers numerous advantages for new industries, not the least of which are available infrastructure, choice location and easy access to feedstock. Which are your key export markets? Are you planning to widen your global export reach? Sadara handles marketing and sales of its products in the Middle East Zone, or MEZ, consisting of Saudi Arabia, Jordan, Egypt, Lebanon, Syria, Iraq, Iran and Palestine. Sadara has contracted one of its parent companies, Dow Chemical, as the exclusive marketer for its products consumed outside of the MEZ. These exports are generally shipped via Dow distribution hubs: EU (Antwerp/Tarragona), FEA (Singapore/Dongguan/Ulsan), Turkey (Gebze), Dubai-Kandla range and South Africa (Durban). There are no plans at present to modify this arrangement. What were the challenges that you faced in your domain and how did you surmount them? Clearly there were many challenges involved in constructing the world’s largest chemical complex ever built in a single phase and assuring the efficient and effective integration of its 26 plants. One important challenge was making sure the complex was brought on-stream as safely as possible, and Sadara achieved this goal with a world-class safety record. How are you dealing with issues such as a drop in international chemical prices, higher domestic feedstock prices and the emergence of global competition? The heart of the Sadara complex is a Mixed Feed Cracker, or MFC, that cracks both ethane gas and refinery liquids such as naphtha. Sadara can adjust the levels of gas and liquids fed to the MFC depending on external circumstances. This modifies the product mix, and thus gives Sadara great flexibility in dealing with changes in market conditions, feedstock costs and the like. What provision are you making for a period of volatile oil prices which has a direct impact on the pricing of chemicals? In its planning, Sadara considers all types of influences on the market – oil prices included. There have been reports that the Sadara Chemical joint venture could be expanded further in terms of capacity. When will this expansion take place? With all successful industrial enterprises, there is the possibility of future expansion. But we have nothing to share with you on this subject at this time. Key issues for a potential expansion will be whether feedstocks and other needed resources will be available. Have you done a study on feedstocks and resources? Access to feedstocks and other resources are always part of the strategic planning for a facility like Sadara. We are fortunate to be located in Jubail, with its availability of essential resources, and to have a parent company like Saudi Aramco, which can facilitate our access to ethane and refinery liquids. With Sadara’s mixed-feed cracker passing performance tests, what performance targets have been set for the furnaces and recovery section? Why is this MFC unique in the region? Sadara has the only mixed-feed cracker in the region. Earlier we discussed its value in terms of market flexibility. How much of investments have come in the Plaschem Park? Have you set any targets for investments there? A number of investors have already committed to developing facilities in PlasChem Park. These include Ravago Middle East Company, Halliburton’s Energy Chemical Sources Company, Rufayah Chemicals Company, Saudi-Korean JV Surfactants’ Detergent Company, Saudi Basic Chemical Industry, Gulf Interchem of Bahrain, Saudi-German JV SADIG-ILCO and US-Saudi JV Harcros-ARA. When will Sadara’s EO/PO pipeline transportation system be commissioned? When is the first wave of EO and PO cluster investors expected at PlasChem Park? Without getting into details, land has already been allocated for some of the EO/PO projects and we are pleased with the degree of industry interest in this particular cluster.